KUALA LUMPUR: The prices of crude palm oil (CPO) have been sliding since the start of the year, which is reflected by the financial performances and share prices of most public-listed plantation players, and analysts are not expecting a significant recovery in CPO prices anytime soon. Based on Bloomberg data, CPO futures have declined about 19% year to date, from RM2,503 per tonne to RM2,016 per tonne at the time of writing. Earlier this month, it fell to RM1,972 per tonne, the lowest level since August 2015. The price of CPO averages at around RM2,306 per tonne year to date. 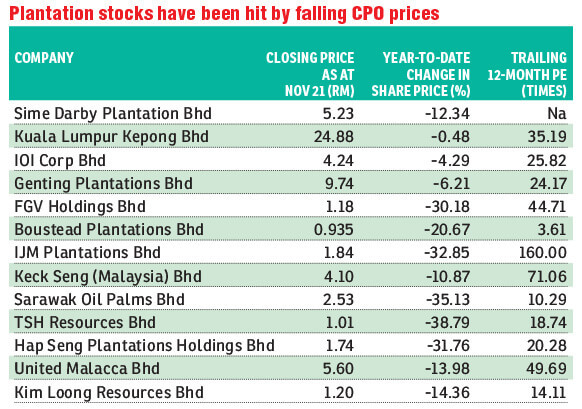 In line with the decline in CPO prices, share prices of plantation companies have come down. To name a few, Sime Darby Plantation Bhd has fallen 12.34% year to date, while IOI Corp Bhd declined 4.29%. Genting Plantations Bhd is down 6.21%. JF Apex Securities analyst Low Zy Jing said CPO prices should not have fallen below the RM2,000 per tonne level. “The RM2,000 per tonne should have been a strong support level. I think the reason why it fell below the level was due to the decline in crude oil prices, and if crude oil prices do not go lower, CPO prices should not fall further either,” he told The Edge Financial Daily. Meanwhile, he said the general decline in CPO prices is due to high inventory levels in Malaysia and Indonesia, coupled with low demand. In October, Malaysia recorded an increase in its palm oil inventory level for the fifth consecutive month, up 7.6% month-on-month to 2.72 million tonnes, which is the highest level since December 2017. While Low said it is unclear why demand has been affected, he said India’s move to impose higher import tax on palm oil of 44% from 30% earlier this year, as well as the higher tax on inbound refined palm oil cargoes to 54% from 15% last year, could have played a part. “The decline in CPO prices has affected the results of plantation players, which have been hit quite badly,” he said. Kuala Lumpur Kepong Bhd reported a 58% slump in its net profit for the fourth quarter ended Sept 30, to RM101.5 million from RM242.12 million a year ago, while revenue shrank 19% year-on-year to RM4.19 billion. Meanwhile, IOI Corp posted a 60% drop in its net profit for the first quarter ended Sept 30, 2018, to RM143.8 million from RM360 million in the previous year. Its revenue saw a slight increase of 0.54% to RM1.88 billion from RM1.87 billion. The drop in performance was not limited to Malaysian players either, as Indonesia’s Indofood AgriResources reported earnings of 8.8 billion rupiah (RM2.53 million) for its third quarter ended Sept 30, a 91% plunge from 100.5 billion rupiah a year ago. Low said most of the companies under his coverage are expecting prices of between RM2,000 and RM2,200 for the coming quarters and added that prices are expected to remain soft up to the first half of 2019. Meanwhile, Hong Leong Investment Bank analyst Chye Wen Fei believes that palm oil output peaked in October but expects the stockpile to remain elevated in the coming months, amid weaker exports. In a recent note, she maintained an average CPO price assumption of RM2,500 per tonne for 2019. “While the increased likelihood of El Nino developing [by end-2018] will be supportive of near-term palm oil prices, we are maintaining our less optimistic view on the sector’s near- to medium-term outlook, on the back of absence of demand growth catalyst,” she said.